When the musical promo of Phir Se had released a few years back, there was good anticipation to check out what does composer Jeet Gangulli along with lyricist Rashmi Virag have to offer. After all, Kunal Kohli is not just the producer and co-director of the film but is also making his debut as a leading man. Considering the fact that he has made musicals like Mujhse Dosti Karoge, Hum Tum and Fanaa amongst other films, he definitely has a taste for good melodic soundtracks. 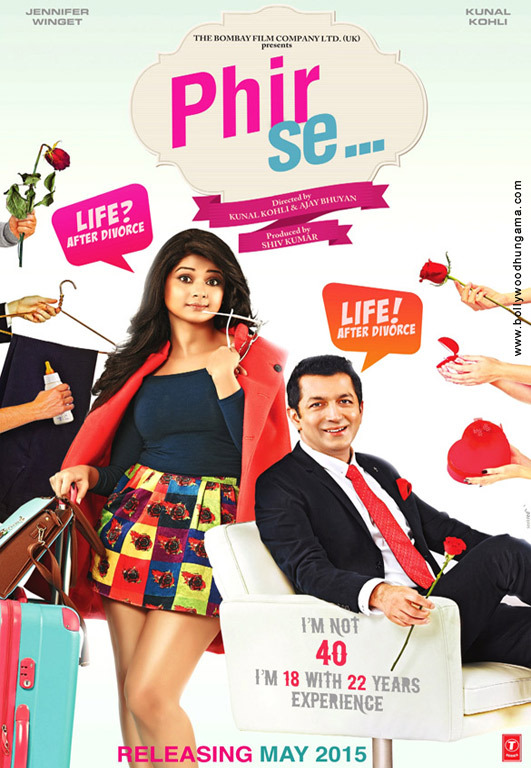 This is what you expect from Phir Se as well which has finally seen a musical release. It is a beautiful beginning for the soundtrack as the title track 'Phir Se' kick-starts with the sound of a guitar. It is just the manner in which you would have expected the musical journey to unfold in Phir Se as soft music takes forward the proceedings for this romantic tale. Moreover, both Nikhil D'Souza and Shreya Ghoshal are quite impressive in their rendition as they bring their soft vocals into play. As they share their thoughts around finding love all over again, you listen to them carefully while humming all the way along. Since the song is quite impressive, it deservingly finds a place in the album a couple of times more. First to arrive is the 'sad version' which comes at just the right point in the film and does make a mark all over again. On the other hand there is an upbeat 'remix' version too by Sandeep Shirodkar that concludes the album and this time around Jeet Gangulli joins Nikhil and Shreya behind the mike as well. The good part about this remix is that it doesn't harm the core essence of 'Phir Se' and keeps its spirit alive. It is the sound of guitar that stays on to be prevalent in Phir Se as it is heard once more right at the beginning, this time for 'Rozana'. What catches your attention right away are the lyrics that go as 'Tum Ho Khabar Aisi, Padhta Hoon Jisko Main, Akhbaar Ke Jaise, Rozaana'. One has to give it to Rashmi Virag for beautifully capturing the mood of love so perfectly right in 'Rozaana' that deserves to find good audience for itself in quick time. Mohit Chauhan and Tulsi Kumar pair up well for this romantic number that has an easy pace to it and ensures that you have a smile on your face while the song plays along. Recommended. Arijit Singh steps into the arena with 'Maine Socha Ke Chura Loon', yet another love song which sees a piano kick-start for itself. Just the kind of song that you would expect in an 'Aashiqui' series, this is a laidback romantic number that has Arijit giving it a lazy rendition. He is joined by Shreya Ghoshal and while Jeet Gangulli sets up the 'mukhda' quite well, it is the 'antara' portions that reminds one of the kind of romantic songs that Kishore Kumar used to sing in the 70s. It is back to the sound of guitar as Mohit Chauhan, Monali Thakur and Shreya Ghoshal come together for 'Yeh Dil Jo Hai Badmaash Hai' which is straight out of Yash Raj Films and Karan Johar school of music. This is expected too, considering the fact that Kunal Kohli has worked with YRF on quite a few films and hence that inspiration is expected to rub off. A spirited number with a feel good appeal to it, 'Yeh Dil Jo Hai Badmaash Hai' fits in well into the narrative of the film. Jeet Gangulli and Rashmi Virag along with their experienced singers do quite well in coming up with a musical album that works from start till the end. Even though the music is arriving three years after it was originally supposed to have, it manages to not just impress but ensure that you would like to play it well on loop.